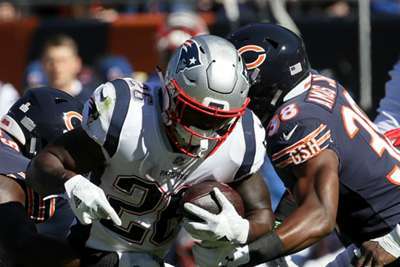 The New England Patriots lost rookie running back Sony Michel to a seemingly nasty injury on Sunday. Michel fumbled the ball against the Chicago Bears and needed help off the field and to the locker room after he got twisted up with a couple opposing defenders early in the second quarter. The team listed it as a left knee injury and he was later ruled out for the remainder of the game, leaving backup Kenjon Barner and James White as the only New England running backs available. Michel had four carries for 22 yards before he left the game. So far in 2018, he has 400 rushing yards for four touchdowns.